​The Trillium path stems from the principles of Waking Down in Mutuality, which honors and investigates the transcendent, physical, and deep relatedness dimensions of the self. This work offers a simple and far-reaching set of recognition-practices through which we can lean-in to the spacious and 'divine' aspects of all that we are, even as we explore and embrace the difficult, estranged, and forgotten facets that tend to conceal our greatest gifts. 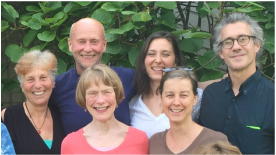 In the company of a diverse and growing community of fellow practitioners from Olympia and the Northwest, and with the wider support and transmission from the international Trillium community, we engage with ourselves and one another through regular local gatherings in a context of mutual encouragement and exploration. These circles help keep us focused on awakening to full recognition and acceptance of the challenging truth of being both divine and human—each as our own unique expression of Being. In this place of practice we can unfold in safety as we recognize with ever-expanding awareness the fullness of our authentic, embodied selves. As we become more established in that reality, we naturally become more completely available to ourselves and the world. 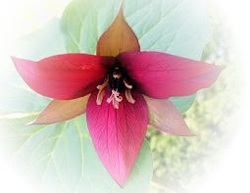 Trillium is something to do for you, that adds you to us! The materials on this website will answer some questions and elicit further curiosity. You will also find links to Trillium Awakening teachers and resources. ​If you are drawn to join us you can find “on-ramp” guidance and people to talk to. Look around. "Your Being is one seamless event. To realize the depth of the boundless part, you must also permit the depth of the bounded, conditioned part." Please say a little bit about yourself and what you'd like to know about us, and we'll get back to you as soon as we can! If you feel comfortable doing so, please leave us your PHONE number, it's really helpful as a backup. ps - we absolutely won't share your contact information with anyone! The Olympia Trillium Community is a volunteer-run organization dedicated to making this powerful work available to those who are hungy for deep, conscious embodiment. Your donation can be applied to support administrative functions or to provide scholarship funds & financial assistance at events.